Back in July, the Australian Energy Market Operator released the results of some rather intensive modelling for the National Electricity Market: the ISP. With the benefit of a little time to consider what it does and doesn't cover, an examination of some of the key components is in order. The Integrated System Plan is a modelling assessment of electricity supply by the Australian Energy Market Operator, prepared as part of the Finkel Review and in light of the transformative changes to the supply of energy currently underway. Depending on your priorities, the ISP either signals the end of coal-fired power, or its importance for meeting demand, or the need to keep it around for as long as possible. It's the latest version of an existing model, or it's a revolutionary roadmap to 50% solar power. The ISP is certainly a detailed effort, with much of that detail released to the public. It would be an interesting and useful collection of work for expanding the literature on electricity network modelling. However, it is instead intended to guide how Australia's power supply changes over the next 20+ years. As such, any deficiencies will tend to steer us towards a suboptimal destination. 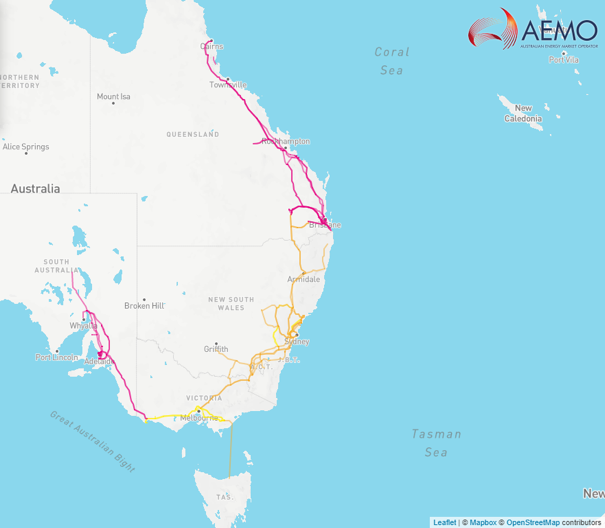 An overview of the ISP, as well as of one of the major related new transmission projects, is available from the Australian Energy Council. Nuclear energy’s proven and potential role. "There are extents of [variable renewable energy] penetration that have not been explored, and for which there is no experience globally." "Expected to produce less energy overall, but continue to provide a reliability and security role to complement variable renewable energy. Renewable energy will erode in the next decade the need for GPG to operate during the day, but GPG production is forecast to recover to near existing levels in the second decade as coal retirements increase." By referring to the 2018 Generation Outlook spreadsheets, this expectation is demonstrated by the presence of 11,823 megawatts of GPG capacity in 2039-40, with a modelled output meeting 5% of annual demand, compared to 11,078 megawatts in 2018-19 which will supply 9.2%. The missing context is that anywhere which isn't desert is probably going to need right of way corridors, like this one west of Sydney. "there is high solar energy correlation across the NEM for all REZs." 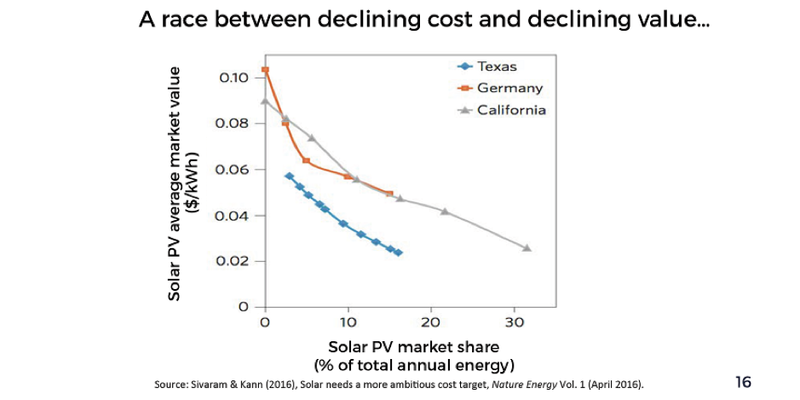 Substantially more solar capacity can undoubtedly be built and connected in the short term, but in other nations there are now clear logistic trends due to various factors more or less halting the expansion of solar's share. Data also suggests appreciable year-to-year variation in generation at high share - some years are cloudier than others. How safe is the assumptions that solar proportions in Australia can blast past what other nations have managed, with high correlation and substantial new transmission requirements? And even if factors such as falling costs can act to enable this, will it be sufficient to stay ahead of the increasingly recognised declining value of the energy observed in other regions? See also recent analysis of marginal capacity addition economics in California from the Berkeley HAAS Energy Institute. We'll get to the matter of energy storage shortly. Wind energy has edged out hydro as the NEM's top renewable source, even though 2017 generation was noticeably lower than that of 2016 with 547 new megawatts connected, "the third highest amount added in the history of the Australian wind industry." Nevertheless, the Fast change scenario does not anticipate much acceleration in addition, and solar dwarfs wind by 2040 in the model. Its share isn’t quite 23%. This recent paper on wind capacity in Europe suggests an average turbine design service lifespan of twenty years. 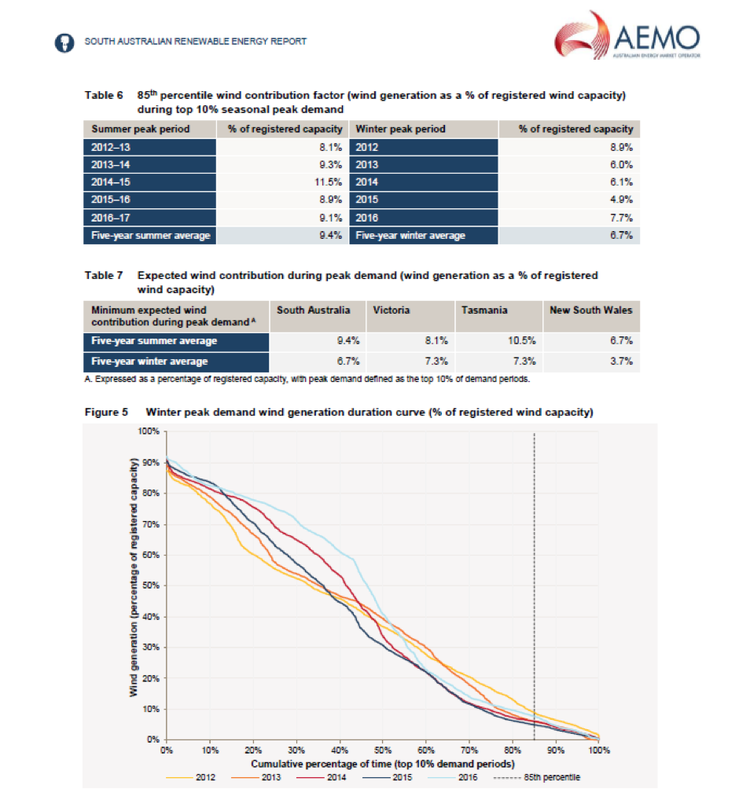 By 2040 a full quarter of the NEM's modelled wind capacity will be at this stage. The ISP unfortunately neglects to account for this, even though retirements for coal (and gas) generation are explicit: "It is assumed that approximately 15 GW of generation (14 GW of coal fired and about 1 GW of GPG) will reach its end of technical life by 2040 and retire." "The tower and foundation of the turbine are... obviously critical to operation, as they can’t be easily replaced. Cracks and corrosion are real threats, and while they can be modelled in design stages, exactly how a turbine will be impacted by the natural environment can’t be accurately predicted. Other potential failures may lie in the electronics – responsible for 13% of failures at present – or in other crucial components like the generator, gearbox and pitch control." Whatever wind capacity isn't decommissioned at end of design service life will tend to face steadily increasing maintenance costs. The shape of this curve doesn't change with increasing capacity no matter how far capital costs fall. "Historical annual changes in global energy intensity... declined by 0.8%/year on average over the last 40 years. ...Even [sustained business-as-usual growth] scenarios require sustained improvements in energy intensity of −1.5 to −1.8%/year, matching the highest annual rates seen over the last 40 years." More fundamentally, do these strong efficiency improvements neglect to account for efficiency rebound? Rebound is the demonstrable phenomenon of increased energy consumption resulting from below-cost efficiency improvements, i.e. not all of the saved energy is left unused. This manifests for transportation, heating and cooling, industry, household appliances, and multi-factor productivity improvements. There are substantial benefits in continuing to improve the efficiency of sectors of the economy such as household energy use, but no modelling is served by overstating them or assuming they are without barriers or costs. The Strong uptake of battery electric vehicles predicts that they will comprise 53% of the fleet in NEM states by financial year 2037-38, consuming 12% of annual electricity (net of rooftop solar output). The Fast scenario has expanded the total number of electric cars 260-fold compared to today. The new material demands of this expansion need to be kept in mind. Recent research in California, where electric vehicles now number close to 400,000, has demonstrated that people predominantly charge them overnight at home. This is obviously anti-correlated with solar, but much more closely correlated with scheduled thermal generation which can operate as needed, day and night. The operation of grid scale storage in the form of batteries has been trialled in California, and the results are relevant to energy planning scenarios which assume an unprecedented scale of bulk energy shifting. "Charging when electricity is cheap and discharging when it is expensive is what first comes to mind as an obvious use of electricity storage. This time-shifting of generation to match consumption peaks involves techniques such as peak shaving and load levelling; these are easy to envision and model and optimize when looking at yesterday’s load and price curves, but very difficult to do in real-time when the load and price are varying stochastically and neither the height nor timing of the actual load peak can be known or recognized till well after the fact. In practice, energy arbitrage only generated enough revenue to barely cover operating expenses." Furthermore, "the trial also revealed how different batteries are from actual generation resources." Despite this, the Fast scenario apparently treats close to 22,500 megawatts of utility scale storage as a functional replacement for conventional generation capacity. Pumped hydro storage (PHS) will inarguably dominate the world's total energy storage capacity for the foreseeable future, and the ISP also cites it as a major component. But this is where simplified assumptions about costs per kilowatt hour, even falling ones, can start to erode a scenario's robustness. Like every natural resource, PHS sites can be ranked in terms of cost effective development of the resource. As such, there are probably real limitations. Though batteries and hydro can't directly substitute for one another, at the massive scale which is being proposed every megawatt and megawatt hour that isn't PHS will have to be batteries. And while the falling cost of batteries is invariably treated as inevitable, it is also just an assumption: in 2016, the reported installed cost of a 7 kWh battery was "nearly $10,000", while today the average is $10,560 for 8 kWh. Perhaps economies of scale will allow grid-sized batteries to avoid these stubborn costs to some extent, but this so far doesn't help distributed energy resources. If the assumptions around the costs of storage are common, the assumptions about emissions intensity are universal. Batteries are highly engineered devices full of extremely purified material: a lot of energy goes in to producing them. As they don't produce any energy of their own, the full lifecycle emissions intensity of the electricity they supply has to be added to the energy source which charges them. Even charging with solar and wind, this takes the combined intensity above 100 gCO2e/kWh according to this fairly comprehensive analysis. While a great improvement on the intensity of today's power network, it's dramatically different to the 0 operational emissions claimed for renewable energy in the Finkel Review final report. It's not AEMO's role to advocate, in any form, for the inclusion of a prohibited technology, and nuclear energy's absence from the ISP is consistent and correct. This is despite the inclusion of modern modular reactor designs in the Blueprint for the Future, the final report from the Finkel Review. Addition rates of low carbon energy sources in kWh per capita per year. Based on Cao et al. 2016 doi:10.1126/science.aaf7131; UAE estimate from World Nuclear Assoc; Australian population data from ABS. Decadal deployment rates for nuclear compared between countries, per generated kilowatt hour and levelised for population, indicate a formidable promise for displacement of fossil fuelled electricity. To date, solar and wind addition rates have been modest. Growth of solar output in particular in politically committed Germany has peaked at less than a quarter of the rate proposed by the ISP Fast scenario (the rate so far in Australia has been a fifth of what's hypothetically required). "The Commission did not find that nuclear power is ‘too expensive’ to be viable or that it is ‘yesterday’s technology’. Rather, it found that a nuclear power plant of currently available size at current costs of construction would not be viable in the South Australian market under current market rules." "Storage and power-to-fuel technologies also offer the potential to displace capital expenditure on the transmission and distribution networks. However, if the expected reductions in the cost of these technologies are not realised, the potential for nuclear power to provide reliable generation capacity to balance the intermittency of wind and solar would be improved." At Bright New World, we assert that the proven potential of nuclear energy is more than sufficient to warrant immediate, equitable inclusion in the design of Australia's future energy supply network, even if optimistic forecasts for the costs of other technologies prove accurate. The path to similarly cost-effective modern nuclear capacity has recently been enumerated - widely publicised excessive costs aren't inevitable or even particularly common. The recently abandoned National Energy Guarantee model presented an opportunity for a solid long term policy framework, as both its mandate and designers understood the importance of a) reducing emissions per unit energy generated, and b) requirements for system strength. It encouraged long-term thinking, which AEMO’s ISP certainly is, but in contrast the ISP is prescriptive and fails technology neutrality. It's time for actual technology neutrality, with emissions being the primary decider. We need all the tools, and we need to take the utmost care. Clean. Reliable. Affordable. 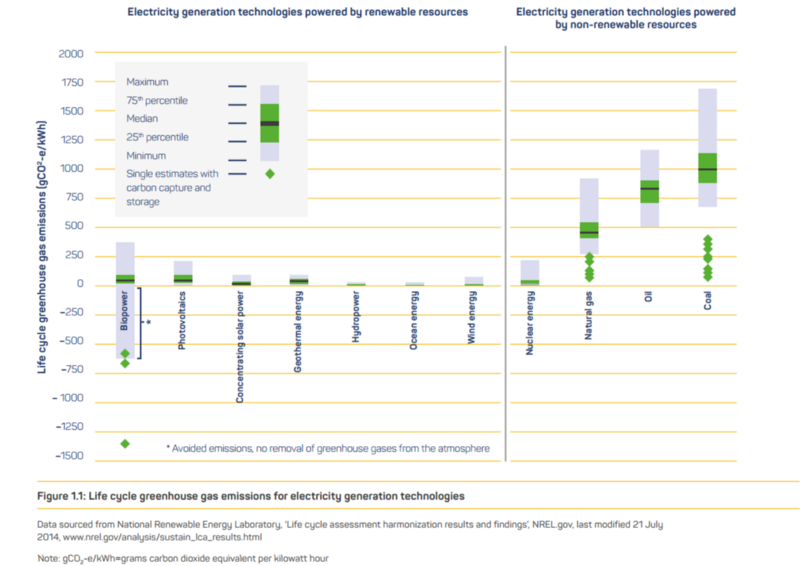 The role of nuclear technology in meeting the challenge of low greenhouse gas electricity supply in the 21st century.